When the camera is connected to a smartphone via a Wi-Fi network, you can use your smartphone to shoot remote photos and view still images/videos. The wireless lamp flashes white. The serial number printed on the base of the camera is the same as the SSID and password. The SSID is "THETA" plus the serial number in the (B) section plus .OSC (in this case "THETAYJ00001017.OSC"). The password is the numbers in the (A) section (in this case "00001017"). You can change the password from your smartphone. The password is initialized by pressing and holding the wireless button while the power is on.The power turns off automatically at this time. 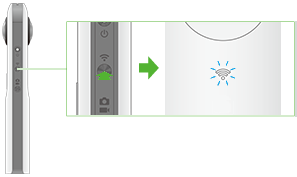 When the wireless connection is complete, the wireless lamp lights white. The status of the wireless lamp shows the Wi-Fi status of the camera. The date and time of the camera are synchronized with the smartphone when connected.